The Artivist Collective is pleased to announce the Artivist Award winners at the 7th Annual Artivist Film Festival. Actor Peter Fonda will accept the Artivist Award for Lifetime Achievement in Arts and Advocacy, Barbara Pyle will receive the award for Environmental Humanitarianism, and Avis Richards will receive the award for Community Advocate. This year’s awards will take place December 4 at the historic Egyptian Theatre in Hollywood at 8pm and will be hosted by Vanessa Williams (“Soul Food,” “The Cosby Show,” “Melrose Place”) and Boris Kodjoe (“Soul Food, “Undercovers”). The Artivist Collective is pleased to announce the Artivist Award winners at the 7th Annual Artivist Film Festival. These awards honor those artists whose exemplary work in their community stands out as a shining example of one’s ability to change the world for the better. Actor Peter Fonda will accept the Artivist Award for Lifetime Achievement in Arts and Advocacy, Barbara Pyle will receive the award for Environmental Humanitarianism, and Avis Richards will receive the award for Community Advocate. This year’s awards will take place December 4 at the historic Egyptian Theatre in Hollywood at 8pm and will be hosted by Vanessa Williams (“Soul Food,” “The Cosby Show,” “Melrose Place”) and Boris Kodjoe (“Soul Food, “Undercovers”). The event will feature celebrity presenters and guests including Frances Fisher, Nicole Ari Parker, Esai Morales, Jonathan Morgan Heit, Annabelle Gurwitch, Leigh Taylor Young, plus Ben, Jonnie, Duncan, and Dave from MTV’s “The Burried Life” and more. 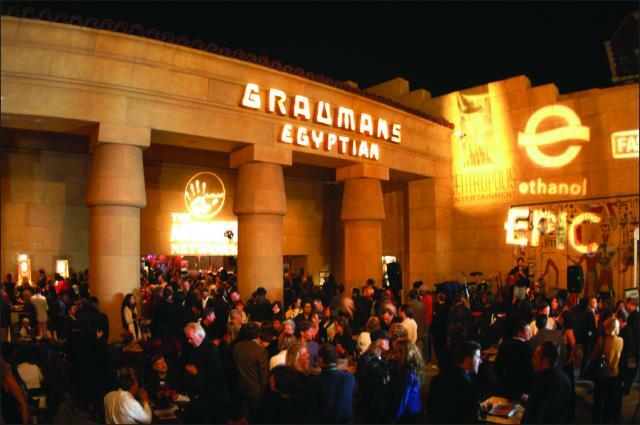 The awards are followed by a lovely catered event in the forecourt of the Egyptian. Limited public tickets for the awards are available http://2010artivist.eventbrite.com/. With an acting career that spans over fifty years in theater and films, Peter Fonda is a celebrated artist, counter-culture icon and a noted member of family of celebrated actors including his father legendary thespian Henry Fonda, his sister actress and fitness icon Jane Fonda, and his daughter actress Bridget Fonda. Born on February 23, 1940 in New York City, the film that propelled Fonda to fame was the iconic Easy Rider. Fonda was driving force behind the 1968 film as the producer, writer and star. He made the film with Jack Nicholson and Dennis Hopper, his life-long friend who acted in and directed the movie. Apart from showing the adventures of motorcycle riders, the movie is seen as an important commentary on societal struggles of the times, encouraging free thinking and making it a cultural landmark. With co-writers Hopper and Terry Southern, Fonda was nominated for the Academy Award for Best Screenplay. As a testament to its influence Easy Rider is listed as one of the AFI’s top 100 films of the last hundred years. Fonda was also nominated for a Best Actor Oscar for his title role in the 1997 film, Ulee’s Gold. He also picked up a Golden Globe Award for Best Performance by an Actor for the performance. Over the years, Fonda has supported numerous motorcycle-related fund raising programs such as Easy Ride for Autism, and the Love Ride, which supports of people with muscular dystrophy. 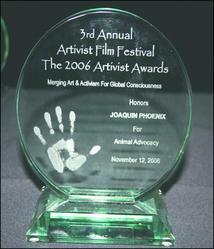 He is truly the perfect recipient of the Artivist Award as he has been involved in all of Artivist’s key areas - animal advocacy with his current film Smitty which emphasizes pet adoption and is part of the Adopt-A-Dog Month campaign; his environmental efforts to encourage alternative energy through supporting the film Fuel and his recent clean-up work in the Gulf of Mexico with the Gulf Coast Fund; and in the human rights field for his work with Doctors Without Borders, plus his work with Best Buddies who recently awarded him their Legacy Leadership Award for his outstanding charity work helping people with intellectual and developmental disabilities. With a career spanning three decades, Barbara Pyle is a recognized Executive Producer and leading expert on the use of media and worldwide communications for television programming on critical global issues. She is also an award-winning film maker recognized for pioneering coverage of complex social and environmental issues and an acclaimed photographer, whose work has been featured on the covers of TIME Magazine as well as in dozens of books and periodicals. Barbara was the co-creator of the popular, animated series, Captain Planet and the Planeteers and the Captain Planet Foundation which provides grants for hands-on environmental projects by children. In honor of Captain Planet’s 20th Anniversary, young people inspired by the cartoon, now adult Planeteers, built a site at http://www.CaptainPlanet.me. Captain Planet now has over 380,000 Planeteer Facebook Fans. They are creating a worldwide Planeteer Movement to engage millennial Planeteers in critical global issues. For her body of work and humanitarian efforts, Barbara has received dozens of personal commendations including the world's most prestigious environmental honor - the United Nations Environment Programme Sasakawa Prize. Usually reserved for scientists, she is the only member of the media to be named a Sasakawa Laureate. Barbara used the award to establish the Barbara Pyle Foundation. Hired in 1980 by Ted Turner, Barbara created the Turner Environment Division. For 20 years, she served as Corporate Vice President of Environmental Policy at the Turner Broadcasting System (TBS). As Cable News Network's (CNN) Environment Editor, Barbara introduced and oversaw environmental coverage, including the original Earth Matters, which premiered on CNN in 1981. By creating strategic alliances with UN agencies and other organizations, Barbara produced and directed over 50 films, has had eight Emmy nominations and won over 100 industry awards (Telly, Gracie Allen, Golden Eagle, EMA, Genesis, CINE, Clarion, Chris). Her films on sustainable development issues including the environment, climate change, empowerment of women, poverty eradication, and population stabilization were the centerpieces of media campaigns that she produced for the corresponding United Nations Summits. These award-winning documentaries, featuring real people with inspirational solutions to complex issues, were broadcast worldwide. Avis Gold Richards is the Founder and CEO of Birds Nest Foundation™, a 501(c)3 non-profit creative group that produces high-quality documentaries, short videos and public service announcements (PSAs) for charitable organizations. An award-winning executive producer and director, Avis has produced and directed over 50 films and multiple websites and events. The goal of Birds Nest Foundation is to provide the media to educate and promote important causes and issues that enable non-profits and other foundations to communicate their messages through "moving pictures." Avis has won more than a dozen Stevie Awards, Telly Awards, Davey Awards, and Aurora Awards for producing non-profit films and videos. The charities that benefit from Avis' work include a host of worthy causes dedicated to improving healthcare and education, serving inner-city youth, protecting against domestic violence, promoting human rights, and defending the environment. Avis is currently producing a public television series entitled "Lunch NYC" for NYC Media, part of the City of New York Mayor's Office of Film, Theatre & Broadcasting, after the successful launch of her short documentary, LUNCH, which was sponsored in part by Earth Day Network. The documentary, screened at film festivals across the United States, has distribution rights in Whole Foods Markets. The series exposes unhealthy foods being served in the public school system across the country and highlights the efforts of individuals actively seeking alternatives to promote nutrition and health. Past Artivist Award recipients include: Olivia Wilde, Hank Azaria, Ted Danson, Alyssa Milano, Joaquin Phoenix, Matthew McConaughey, Mira Sorvino, James Cromwell, Ed Begley Jr, Tippi Hedren, Mike Farrell, Claes Nobel of the NOBEL Prize Family and noted producer Stephen Nemeth. Artivist is the first film festival dedicated to addressing International Human Rights, Children's Advocacy, Environmental Preservation, and Animal Advocacy. In addition to the artist awards, Artivist also awards a feature and short in each of these four categories. Additionally the Artivist Spirit Award goes to the film that best embodies the overall mission of the festival. The Artivist Film Festival screens over 40 independent, narratives, documentaries, shorts, and experimental films from around the globe at the Egyptian Theater in Hollywood from December 1-4, concluding with the Artivist Awards. The festival’s mission is to strengthen the voice of advocate artists - "Artivists" - while raising public awareness for global causes. Since its inception in 2004, the Artivist Film Festival has showcased over 450 films representing more than 45 countries around the world. Artivist has reached millions of people with its film festivals in Hollywood, London, Tokyo, Mexico City, New York and Lisbon, and through its website at http://www.Artivist.com. Additionally, in recognition of the socially conscious platform it provides, Artivist has been endorsed by Claes Nobel of the Nobel Prize family, Amnesty International, and the United Nations Department of Public Information. Many films awarded at Artivist have gone on to great acclaim including Academy Award winner Born Into Brothels, Academy Award Nominees Super-Size Me and God Sleeps in Rwanda. The festival has also held the Los Angeles Premieres of Fast Food Nation, Emmanuelle's Gift, Stolen Childhoods, Zeitgeist, Zeitgest Addendum and Trudell. For 2010, Artivist proudly welcomes back PETROBRAS as its Official Community Partner. For the past four years Petrobras has supported the efforts and expansion of the Artivist Film Festival. Understanding the interdependence between humanity, animals, and the environment is crucial in our global community. By working with individuals and groups, organizations and companies, we can create long-term solutions to our global problems. Petrobras, a Brazilian company, is one of the largest distributors of Ethanol Fuel in the world. With a 30 year history of producing, distributing and using ethanol from sugar cane as fuel for vehicles. The Petrobras Environmental Program, is focused on water protection and biodiversity, supporting hundreds of projects that aim to recover the water bodies and sources, as well as that which promotes the rational use of water resources and environmental education. Petrobras is the only energy company that is part of the Global Compact Board of the UNITED NATIONS, committing its corporative government to the 10 principles set forth by the UN. Additionally, Petrobras is the largest funder of Cultural Arts Programs in Brazil, and a partner of various animal advocacy programs which include endangered sea turtles, the spinner dolphins, the manatees, and various save the whales programs. ARTIVIST is a 501c3 nonprofit organization. All proceeds benefit the Annual Artivist Film Festival, creating a platform for socially conscious "Artivists" to share their inspirational and informative films with the world.